What motivates humans to collaborate? 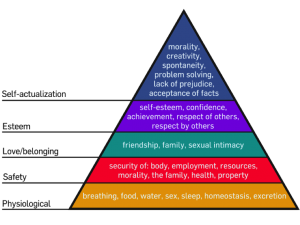 I’ve alway been used to seeing Maslov’s hierarchy of needs as a 5 layer pyramid with ‘self actualisation’ at the top. There’s a lot in his 1943 theory that is relevant to why people would want to collaborate on a deep human motivational level. The need to belong and be accepted in the third level and the desire for the respect by others on the fourth level are two examples of why we are social in business as well as in life. My nagging doubt about this model though was that the apex of human motivation is shown to be more selfish, concerned with fulfilling one’s own potential to the utmost. These transcendence needs are defined by going beyond what you can become and embrace helping others to achieve self actualisation. This opens up the possibility of human motivation to collaborate at the highest level. Maslov notes that “The transcenders are far more apt to be innovators, discoverers of the new, than are the healthy self-actualizers… Transcendent experiences and illuminations bring clearer vision … of what ought to be, what actually could be, … and therefore of what might be brought to pass.” Viktor Frankl later added Self-transcendence to create his own version of Maslow’s Hierarchy to show this. So it’s no surprise that in open innovation we often come across people with a highly developed sense of what we call business empathy. They easily recognise the benefits of collaboration on a rational level but also are motivated by helping people and enjoy it on an emotional level. Sustainable partnerships are built on a passionate and compassionate commitment to helping people identify, pursue and reach their own personal unique potential. We’re witnessing the development kind of ‘post-competitive business’ behaviour in this regard and it’s very exciting. David, great post. In your diagram is also the new level about Safety and Security which is anything but a given for many people in today’s world. About collaboration. I personally don’t believe that one needs to move beyond self actualisation to have collaboration as a value and belief at the heart of ones ethos. I work in an organisation that has collaboration, trust and moderation as the three beliefs at the heart of everything we do. It’s important to understand that these are beliefs rather than processes, tools or techniques (so contextualising them with Maslow is correct. Very interesting post David. I think what you describe as a post-competitive business behaviour comes down to a value optimising mindset rather than a value maximising mindset, in that value created is distributed but of course as a result of that we benefit in some way as well (I can feel a venn diagram coming on). 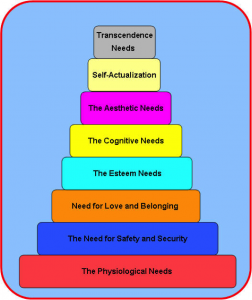 Great post – lovely to see this aspect of Maslow’s thinking and very useful. One side question: Are you David Townson or David Simoes-Brown? It wasn’t clear from your by-line and I wanted to quote you correctly! Rob, thanks for your comment and I’m looking forward to see your views on collaboration. Thanks for the link too. Yes, mindset is everything. Business is traditionally secretive and competitive so it’s hard to be open and collaborative just like that. Roland, nice idea about value optimisation in collaboration. It’s easy to hurt collaborations by wanting too much. Cassie, that’s excellent and clearly maps onto Maslow Mk2 – the idea of Collective Individualism at the apex. Anthony thanks for your comment and I will be more clearly me in future! Looking forward to being quoted.